Born in El Paso, Texas, Khalid Robinson is a 19-year old R&B singer, signed on to the Right Hand Music Group and RCA Records. Even though this singer-songwriter started out pretty recently (in 2015), he has managed to make quite a name for himself in a short amount of time. His debut single, “Location” is what put him on the map and got him noticed by big names in the industry. This song peaked at number 16 on the US Billboard Hot 100 and has also gone Platinum. If you want to catch a glimpse of what this young man has to offer, you ought to grab these Khalid tickets! Khalid will be performing in a number of cities across the US, starting June 17th, 2017. Soon after entering the music industry in 2015, Khalid was noticed by several publications. His name began appearing in various lists such as “Artists you need to know” and others. He was also appearing on online publications such as Billboard, Buzzfeed, Rolling Stone and Yahoo. His single “Location” is his most successful work to date, finishing the year 2016 at No. 20 on the Billboard and reaching the Top 10 in the start of 2017. The song premiered on The Fader, after which it managed to get a staggering six million views on YouTube. On top of that, the song got a lot of attention on Spotify, where it was streamed 35 million times. His star started to rise pretty fast. In the first week of February, he was named by Apple Music as its New Artist of the Week. Soon, the young man was out on tour. A grand tour was organized, which spread over 21 cities in January and February, 2017. This “Location Tour” had all of its venues completely sold out, including the 1,500 capacity Tricky Falls in El Paso. The tour also continued on in Europe. Khalid Robinson released his debut studio album on the 3rd of March, 2017, called American Teen. And he is currently out on tour again. It is going to be a tour you don’t want to miss. Grab these Khalid tickets at the earliest and reserve your seats well in time. With this star’s rising fame, there is no doubt that the tickets would be sold out in a very short amount of time. Khalid has cited various artists as his inspiration in music making. But his biggest inspiration remains his mother. His mother, Linda Wolfe, worked in the military as a supply technician for 10 years and sacrificed several opportunities to pursue her own dreams to raise Khalid. As far as musical inspirations go, Khalid talks about the influence of several artists in inspiring him. These include names such as Kendrick Lamar, Frank Ocean, Grizzly Bear, Father John Misty, A$AP Rocky, India Arie, James Blake and Chance the Rapper. All these R&B, hip-hop artists have contributed greatly in adding certain flair to the music of Khalid. Other than that, Khalid has also performed as a featured artist on songs by various artists. This includes his contribution to the song “Electric” by Alina Baraz, “1-800-273-8255” by Logic featuring Alessia Cara and “Rollin” by Calvin Harris featuring Future. All these songs were well-received by fans of Khalid. Other charted songs by this Texas-born artist include “American Teen”, which reached number 22 on the US R&B charts and “Young, Dumb and Broke” from the same album, which managed to reach the number 23 spot on the US R&B charts. Khalid will be performing at a number of venues all across the country. The first show is expected to kick off at 06:00 PM on Saturday June 17th 2017 in Maine State Pier. Subsequent shows will be held in Atlanta, Boston, Chicago, Dallas, Denver, Houston, Las Vegas, Miami Beach, New York and Montreal. If you happen to be in any of these locations this summer, you need to get your hands on these Khalid tickets at the earliest! The tour is expected to go on well into Fall 2017. The last of the shows will be held on September 21st, 2017 at the Masonic Auditorium at Nob Hill Masonic Center. Khalid Free Spirit Tour Popular R&B musician Khalid has added Atlanta to his 2019 Free Spirit World Tour itinerary. The Fort Stewart native will begin the North American leg of his travel in mid-April with performances on consecutive Coachella weekends. He will also be playing at a number of other music festivals including the Beale Street Music Festival and the Hangout Music Festival. Other stops on the tour include Las Vegas, Phoenix, Sacramento, Portland, San Diego, Los Angeles, Tacoma, Houston, Kansas City, Chicago, Toronto, Washington, New York, Boston and Montreal among others. Khalid is scheduled to play in Atlanta at the State Farm Arena in mid-August. Get your tickets now to enjoy a great show at the home of the NBA’s Atlanta Hawks and the WNBA’s Atlanta Dream. The R&B star, who has also collaborated with Calvin Harris for his hit single, Rollin, Khalid released his much anticipated debut album, ‘American Teen’ on March 3, 2017. He is now on tour to support it and the trek will soon bring him to Europe. He will perform his first show in the continent at the Sweden Nobelberget in Stockholm on February 1, 2018. Khalid will then go on to perform gigs in major cities like, Oslo, Warsaw, Berlin, Amsterdam and Paris. He will be concluding his tour in Europe by performing his last concert at the UK O2 Academy in Glasgow on February 18, 2018. Nothing beats the joy of watching your favorite music artist perform live! Khalid's concert dates are out and fans are looking forward to the upcoming shows. The next concert will be held in Syracuse at the Carrier Dome on 26-Apr-19, while the last available date is for the event scheduled for Miami at the AmericanAirlines Arena on 17-Aug-19. For complete information regarding dates and venues, please visit our website. The average price for Khalid Tickets start from $55. The minimum get in price is $9 for Khalid Tickets at the Pechanga Arena - San Diego, San Diego. For a detailed look at ticket prices and amazing discounts, visit our website. Q:How can I pay for my Khalid Tour Tickets? A:If you have a valid credit card only then you will be able to buy Khalid Tickets from our certified brokers. This is because it is against our policy to accept payment made through cash. We don't offer cash on delivery service. Q:When will Khalid start his Tour? A:The latest R&B sensation, Khalid made his mark in the industry earlier this year when he released his debut album, 'American Teen.' He is now going on a tour which is expected to kick off on July 13th. His trek will take him to multiple cities including, Redmond, San Diego and Las Vegas. He will be ending his tour on September 21st. So, if you want to find enjoy his performance live then you have to buy your Khalid Tickets from our certified brokers via our website today because people are already rushing to get them. Q:Are you offering discount codes for Khalid Concert Tickets? A:Kindly contact our sales representatives to get information on discount codes. Only they have details on promos and codes. Khalid Tickets price is already set at affordable rates on our website by our brokers. You can look through our vast inventory and take your pick accordingly. Q:Can I get Discounted Khalid Concert Tickets from your website? 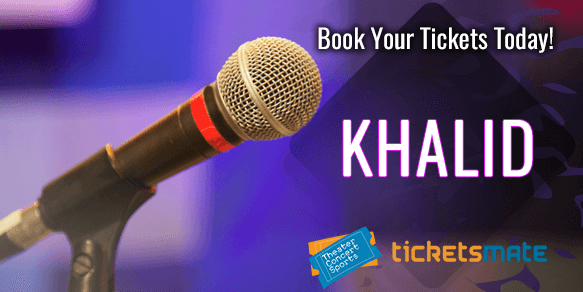 A:We do offer discounts on tickets for different events and you can check if discounted Khalid Tickets are available right now by going through the price listings on the relevant page of our website. Even without the discounts, the prices on offer by our brokers for the tickets on our website are very competitive. All you have to do is go through the price range and pick the price that suits your budget. Q:What is the last date to buy Khalid Tickets 2018? A:There is no last date as such to buy Khalid Tickets because tickets will be available for as long as they are not completely sold-out. So, if the tickets are available even a few days before the event, you will be able to buy them. Having said that, it is not advisable to put off your purchase because tickets are limited in numbers and are mostly sold-out well in advance. Q:I heard that you are offering cheap Khalid Tickets. Is it true? A:Yes, it is true. Thanks to our brokers you can now find Khalid Tickets at very reasonable prices on our website. Since Khalid is one of the fastest rising R&B acts, people are rushing to get their tickets so, if you too want to enjoy his performance live then get yours as soon as possible before we no longer have them in stock. Q:What are the Khalid Tickets Prices for the event at the Pne Forum in Vancouver? A:Khalid is a BET Award nominated R&B singer from Texas who is going on a tour this summer to support his debut album, 'American Teen.' He will soon be taking the stage at the Pne Forum in Vancouver so, if you want to catch him live in concert then you can buy Khalid Tickets from our website because our certified brokers are selling them there at an average price which currently hovers at $308. You can also get them from our trusted brokers at the minimum price which is at $100 right now. Q:Will I be able to buy Khalid Concert Tickets at better prices close to the event? A:It is very difficult to tell whether you will be able to buy Khalid Tickets close to an event. Since changes in tickets prices are dependent on multiple factors, it is close to impossible to predict how the prices will behave at a particular time in the future. While the prices might go down, there are the same number of chances that they might increase. Besides, there is a more than reasonable chance that tickets might be sold-out well before the event. Q:What is the price of Khalid Tickets? A:Khalid is an upcoming hip hop star who is now going on a tour. If you want to see him perform live, then book your Khalid Tickets from our brokers off our website. The highest average ticket price for Khalid Tickets is $262 whereas the lowest average ticket price stands at $96. On the other side, the highest get in price is $198 while the lowest get in price is just $49. Q:What information can you give me on Khalid Tour 2018 and its tickets? A:The breakout R&B singer and RCA signee, Khalid announced his 25-date North American tour earlier this year. The American Teen Tour is in support of his debut album of the same name that came out in March 2018 and peaked at number 3 on the US R&B charts. The trek will start on July 12 from Portland. Please browse through Khalid Tickets inventory on our website to make your purchase.